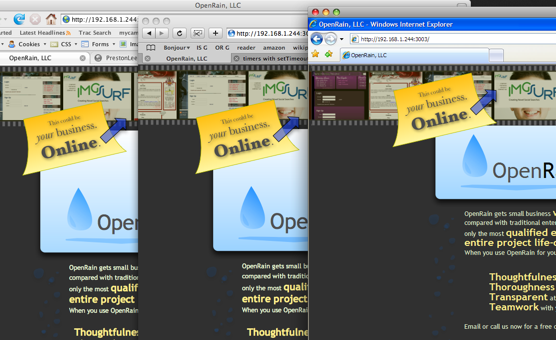 We never spent a ton of time on the OpenRain homepage, so we decided to shake it up today in response to user feedback. I wanted to make our proposition clearer while keeping the existing brief one-page style, and add some awesome sauce yet stay business friendly. Check it. As usual, a significant percentage of the development time was spent figuring out a combination of hacks to make IE6/7 render as close to “normal” as possible. Below is a screenshot of how FireFox, Safari and IE6 (from left to right) lay out the floating divs and images after a couple hours of IE-specific work. Three stupidity points are awarded to IE for the following reasons..
IE also has issues determining float positioning, so the sticky note has a few IE-specific lines to keep it from shooting through the top of the body. Transparent PNGs have never worked correctly in IE6, and the hack to “fix” the issue severely distorts affected images. 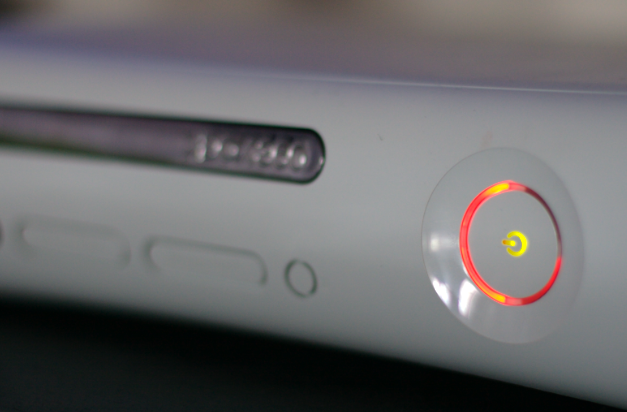 I powered on the ol’ Xbox 360 this weekend to finish Mass Effect, a feat which I was especially pumped about since I’ve been told I’m extremely close. Much to my surprise, Microsoft had left a super special, albeit slightly belated Christmas surprise up in my tubes. Awesome!! Thanks, Redmond!! OpenRain affiliate img surf‘s Mugr facial recognition services have been receiving some press lately. Here’s the lowdown of what’s been happening..
ReadWriteWeb.com article, by Josh Catone. AltSearchEngines.com comparison, by Charles Knight. RoughType.com article, by Nicolas Carr. Official Mugr blog, by the Mugr team. Public Mugr developer support Google group. Mad props to the Mugr team for the thrill ride thus far!